The Astronomical Society of the Pacific, founded in 1889, has always seen astronomy education as a vital part of its mission. In recent years, the Society has directed its focus towards astronomy education as a primary mission. With its 119th annual conference, the ASP provided a unique opportunity for astronomy educators to present programs, interactive workshops and poster presentations. 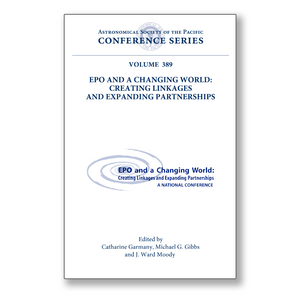 The three-day meeting in September 2007 included 48 interactive workshops and 78 individual posters centered on the themes "Innovative Partnerships and Delivery Methods," "The Evolving Nature of Astronomy Research and Implications for EPO," and "The EPO Profession: A Changing World." Networking sessions are summarized, and there are summary reviews of the four major themes presented by "rapporteurs." Multiple presentations on the upcoming International Year of Astronomy make this volume particularly timely.